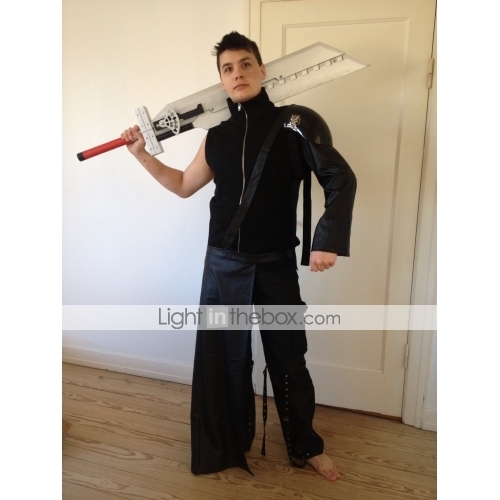 Im glad about my purchase of "Final Fantast VII Sky Struggles Cosplay Costume" and the accompanying "Final Fantasy VII Sky Struggles Wood Cosplay Fushion Sword". However, you would like to also buy associated wig, boots, gloves, belt, earrings and lenses at the same retailer. The quality of the fabric seems to be top, but I would say shoulder "armor" if you can call it, it should be possible to make it different, so its more solid and not so bad. 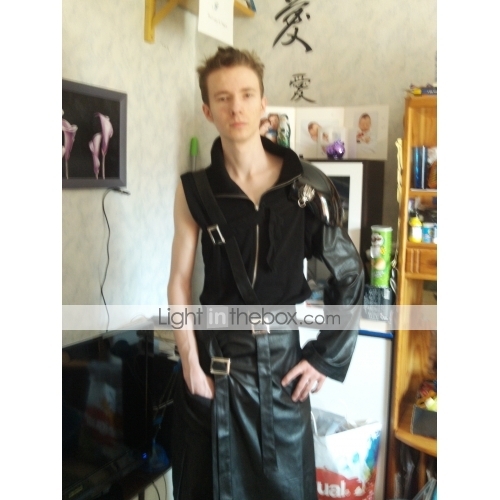 All in all 4 stars from me	Er mega glad for mit køb af "Final Fantast VII sky Stridigheder cosplay kostume" samt tilhørende "Final Fantasy VII sky stridigheder træ cosplay fushion sværd"
Ville dog ønske at man også kunne købe tilhørende paryk, støvler, handsker, bælte, øreringe, og linser hos samme forhandler. kvaliteten på stoffet virker til at være i top, dog vil jeg mene skulder "rustningen" hvis man kan kalde det det, burde kunne laves anderledes så den sad mere fast og ikke så ledt falder af. So got the cosplay 2 weeks ago, which is to mention that it lasted until the delivery only 16 days with me, because competitors do not mention I may much longer. There were no problems with the customs as you hear from other shops. Only a small fee (at 17 €), which you have to pay the driver, was brought to me by UPS. Everything was packed clean and was also explained exactly by the driver. Incidentally, the customs costs are even mentioned in the info mail, was with me anyway. The Cosplay itself: There are minimal details that are slightly different, but only noticeable if you have the films and games for direct comparison. If the mini disturbed differences, it is all sewn / attached that you can change it if necessary. The fabric is comfortable and of high quality, at least for such a product, have worn it twice on larger conventions and also washed several times (but only to 30 degrees) and with detergent for black. So far, no wear, so it can be kept and worn more often. Greetings Dominic	Also hab das Cosplay vor 2 Wochen erhalten, was zu erwähnen ist das es bis zur Lieferung nur 16 Tage bei mir dauerte, da brauchen Konkurrenten die ich nicht erwähnen darf wesentlich länger. Es gab keine Probleme mit dem Zoll wie man das von anderen Shops hört. Lediglich eine kleine Gebühr ( bei 17€ ) , die man dem Fahrer zu entrichten hat, wurde bei mir von UPS gebracht. War alles sauber verpackt und wurde auch vom Fahrer alles genau erklärt. Im übrigen werden die Zollkosten sogar in der Info Mail erwähnt, war bei mir jedenfalls so. Es sind minimale details die etwas anders gestaltet sind, fällt aber nur auf, wenn man die Filme und Games zum direkten Vergleich hat. Wen die mini Unterschiede stören , es ist alles so genäht/befestigt das man es notfalls selber ändern kann. Der Stoff ist bequem und qualitativ recht hochwertig, zumindest für so ein Produkt, habe es schon 2 mal auf größeren Conventions getragen und auch schon mehrmals gewaschen ( allerdings nur auf 30 Grad ) und mit Waschmittel für schwarzes. Bisher keine Abnutzungen , kann also durchaus aufbewahrt und öfter getragen werden. love it! fits perfect. exactly like picture and description. love it! fits perfect. exactly like picture and description. this is brilliant i am a medium usually and that is what i bought i maybe have should have bought the next size up but i have a way around that for the price this is excellent. Im well happy with it. this is brilliant i am a medium usually and that is what i bought i maybe have should have bought the next size up but i have a way around that for the price this is excellent. Im well happy with it. Excellent quality garment and fitted perfectly, very quick delivery, but had to pay cash on delivery for getting it through customs which was unexpected since when i have ordered items before ive received an email informing me to pay by debit card before customs would release it this added about £18 to the cost. The costume was extremely well packaged. Excellent quality garment and fitted perfectly, very quick delivery, but had to pay cash on delivery for getting it through customs which was unexpected since when i have ordered items before ive received an email informing me to pay by debit card before customs would release it this added about £18 to the cost. The costume was extremely well packaged. It took a bit, 1 month, even if it said "processed in 24 hours" with 35 days for the delivery. Beside of that, which is normal (I mean theyre in China), the product arrived and its much better than I expected. Quality is very good. XXL for me and Im 1.90m, average weight, about 88 Kg. It took a bit, 1 month, even if it said "processed in 24 hours" with 35 days for the delivery. Beside of that, which is normal (I mean theyre in China), the product arrived and its much better than I expected. Quality is very good. XXL for me and Im 1.90m, average weight, about 88 Kg. Impressive quality costume, very good looking exactly as in the picture! Impressive quality costume, very good looking exactly as in the picture! loved the suit, fits nice, hope yall can make a sepheroth suit for next year! loved the suit, fits nice, hope yall can make a sepheroth suit for next year! It came quickly and it was a great costume. Material is a little cheap and can run a little small due to the different continent it comes from. But overall, it wasn’t a bad costume, great beginner costume for those getting the Cosplay. It came quickly and it was a great costume. Material is a little cheap and can run a little small due to the different continent it comes from. But overall, it wasn’t a bad costume, great beginner costume for those getting the Cosplay.